February 12, 2011 /Photography News/ New York University arts professor Wafaa Bilal, who recently implanted a camera in the back of his head, underwent surgery on Friday after his body rejected one of the titanium posts anchoring the device to his skull. 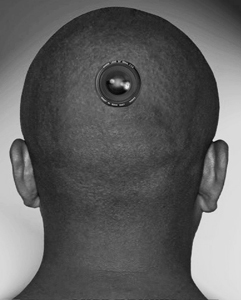 Wafaa Bilal, 45, an assistant professor at NYU’s Tisch School of the Arts, was commissioned to implant the camera in his head for one year by a museum in Qatar, part of a project that broadcasts to the museum and to a website a live stream of images snapped automatically by the device at 60-seconds intervals. The 10-megapixel camera was attached to Bilal’s skull during a November procedure at a piercing studio that specializes in body modification. Despite antibiotic and steroid treatment, Bilal's body rejected the device, causing him constant pain. Bilal underwent surgery to remove one of the posts that held the camera in place and was expected to re-install the device after the wound healed, according to a report in The Cronicle of Higher Education. Until then, the camera will remain tied to the back of Bilal's neck. To see photos from the project so far, check 3rdi.me. I hope they paid him alot of money to do that, a risk that not many are willing to take. Why not just make him wear a camera hat for a year instead?